For a small Californian brand that’s entered a market dominated by the likes of Shimano and SRAM, Praxis Works has done a damn fine job of sticking it to the man. Commercial success was originally achieved by way of durable, cold-forged chainrings (being one of the only brands outside of Shimano that forges chainrings), and Praxis is of course well known now for its high quality bottom brackets too, which cover pretty much every conceivable standard on the market. Well, that we know of anyway. We’ve tested and reviewed plenty of Praxis components before, including the excellent wide range cassette, and the bombproof, hollow-forged Girder M30 crankset, the latter of which earned praise for its stout construction and clever PF30-compatible threaded bottom bracket cups that provided creak-free performance. The Lyft is Praxis Works first carbon fibre crankset. 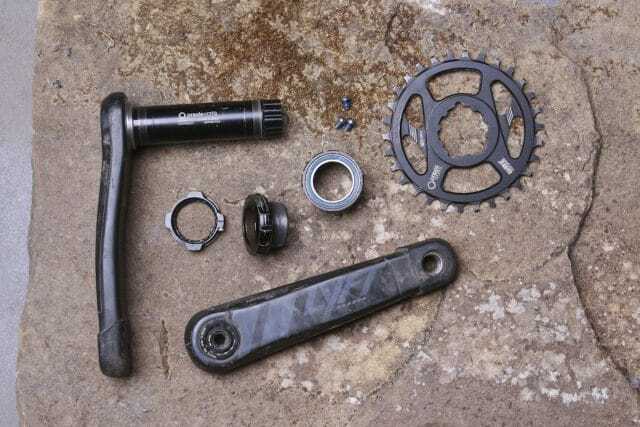 Since launching the Girder M30 cranks under the Turn label, Praxis has expanded its crankset offerings across the road, cyclocross and mountain bike markets, and now has a variety of solid-forged and hollow-forged alloy cranks, and now carbon cranks too. Thankfully they’ve ditched the confusing Turn name too, and now everything is branded as Praxis. The crankset I’ve been testing is the much-anticipated Lyft carbon crank, which was first announced in early 2016 at the Taipei Bike Show. Following a delayed development period, Praxis finally released the Lyft cranks in mid-2017 as a direct competitor to the popular (and very lightweight) Race Face Next SL. With chunky hollow carbon crank arms, a 30mm alloy spindle, and a direct mount chainring, claimed weight on these is a feathery 460g. The Lyft can be had in two arm lengths, with a variety of chainring sizes on offer. The beefy carbon arms are actually hollow to reduce weight. Like the Girder M30 I’ve tested previously, it’s apparent as soon as you pull the Lyft crankset out of the box that this is one slick piece of kit. There’s a chunky alloy spindle, quality hardware, and an impeccable finish overall. Praxis even includes crank boots and sections of pre-cut heli-tape in the box, so you can choose to protect the crank arms or not. What’s also immediately apparent when you pick these cranks up is that they are very, very light. 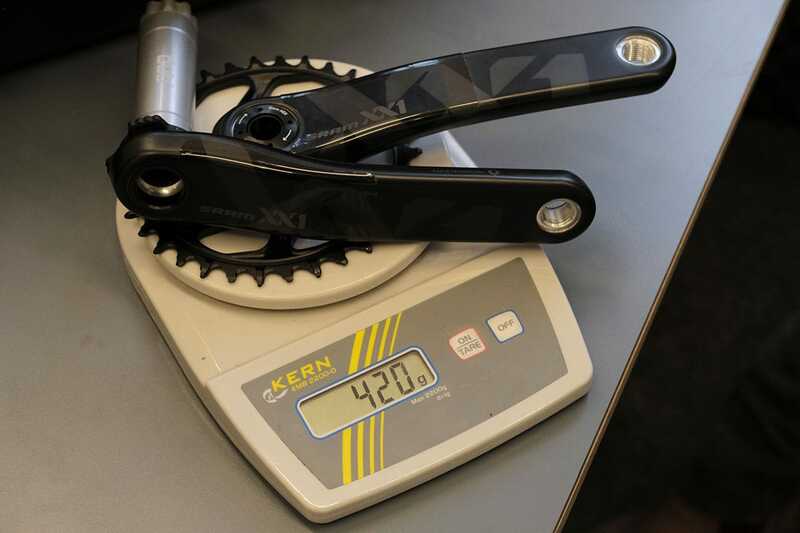 According to our scales, the Lyft cranks came in 458g with a 30t direct-mount chainring and 170mm long arms. Compare that to the alloy SRAM GX cranks I pulled off the bike (664g) and the SRAM Descendent Carbon cranks (567g) that I’ve been testing recently, and it’s clear that there’s the potential to save a good chunk of weight. As mentioned above, the Lyft cranks do come in 30g heavier than the Race Face Next SL, but they are 15g lighter than a set of SRAM XX1 Eagle BB30 cranks, and a whopping 125g lighter than a set of Shimano XTR Race cranks. In short, they’re right up there. 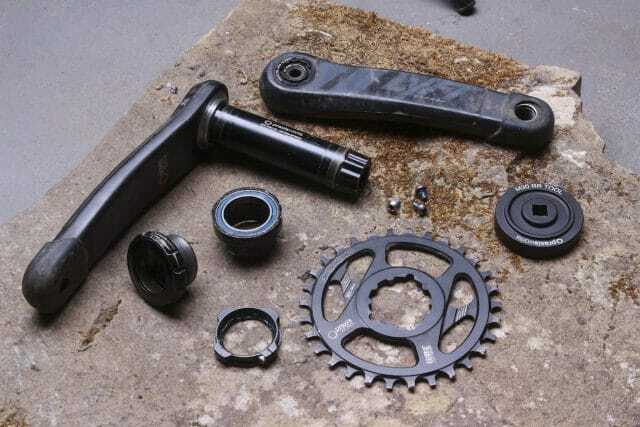 Each crank arm is made from carbon fibre, while almost everything else (aside from the three steel chainring bolts) is made from machined alloy. To reduce weight and increase stiffness, Praxis has used a proprietary construction method to make the crank arms hollow. How it does this and how the metal pedal threads are fixed into the arms is a closely guarded secret – Adam Haverstock of Praxis said he’d have to kill me if told me. And personally, I feel that I still have a good few years in me yet. Unlike Praxis’ other cranks, the Lyft spindle is 30mm in diameter all the way through. The alloy spindle is a thick, 30mm diameter affair, and as the name implies the M30 THRU SL axle is 30mm throughout the entire length. This differs from Praxis’ other cranks, which see the axle stepping down to 28mm on the non-drive side where it locks into the non-drive side bearing. The reason? 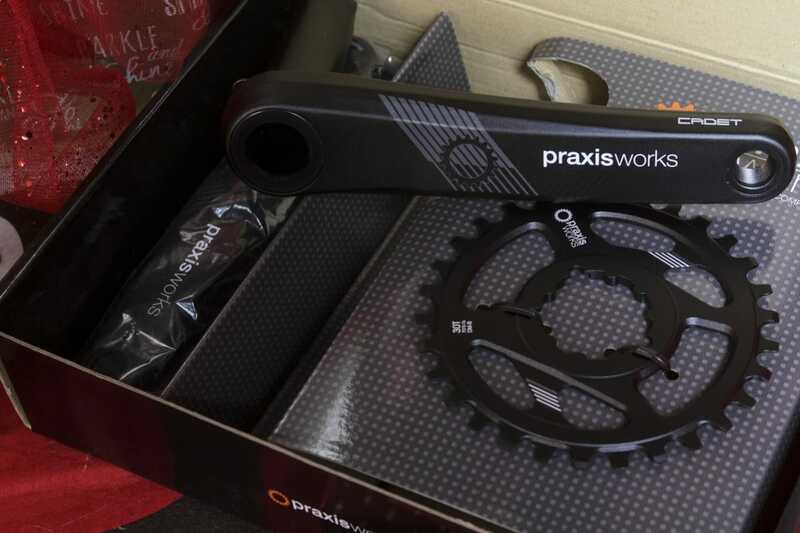 It’s all to do with bearing preload and getting the balance right, which Praxis believes is a more pressing requirement for those choosing to run such a high-end crankset. In order to achieve the correct preload, there’s a threaded alloy collar that sits on the non-drive side crank arm, which allows you to tighten or loosen the preload by hand, before locking it down with a 2.5mm hex key. This is a similar system to other BB30 cranks out there from SRAM, Race Face and Rotor, but it’s been executed better here by avoiding any plastic, as well as using a steel bolt that’s bigger than the usual 2mm. The alloy preload collar works very well. As is standard these days, the Lyft cranks come sans bottom bracket. The idea being that you choose the right BB for your frame, depending on whether you’ve got a threaded or press-fit shell. It means you’ll have to factor in an extra £35 for the threaded BB cups, or £65 for the press-fit conversion BB, though in my experience both are very well-made items. 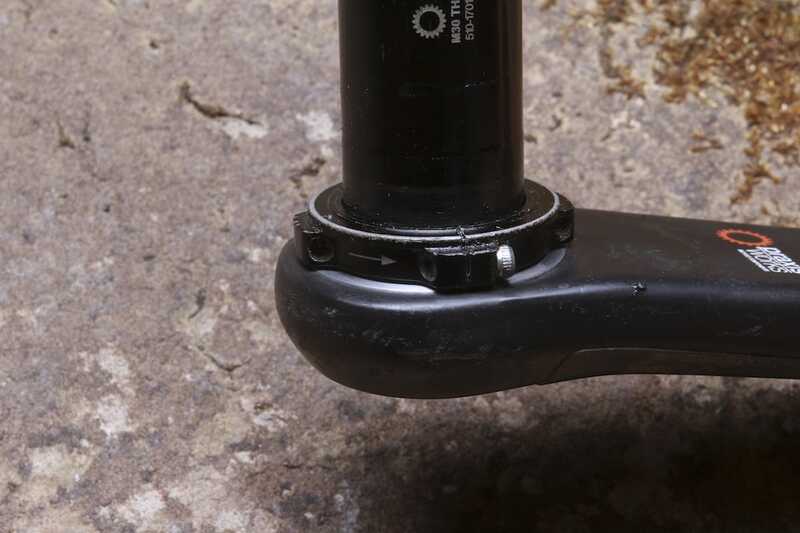 And if you want to know how Praxis’ PF30-compatible bottom bracket works with its threaded centre section, check out my review of the Girder M30 cranks. I’ve been testing the Lyft cranks with a threaded bottom bracket. You’ll need Praxis’ special BB tool to install the M30 BB. I’ve been running these cranks with the standard threaded BB cups, which put the oversized bearings on the outside of the frame in order to fit that big 30mm spindle through a regular 68/73mm English threaded BB. The cups require a specialist M30 BB tool from Praxis, which isn’t included with the cranks. Once bolted up on the bike, everything goes in place exactly as it should. 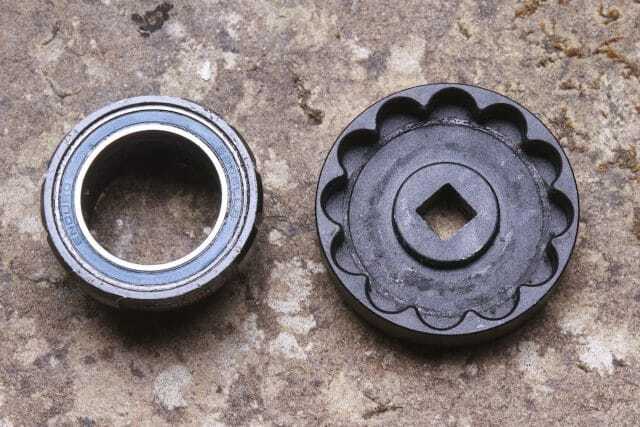 The bearing preload collar works as intended, and it’s pretty straight forward to get the right preload to take up any slack that could lead to clicking, ticking or any other annoying noises. We tested the Lyft cranks on a variety of bikes during the review period, which included a Whyte T-130, an Orange Stage 5, and an Orange Five. There were no issues with the latter two bikes, but I did encounter some clearance issues with the Whyte T-130 due to the extra-thick carbon crank arms. The cranks still fit, but it meant I had to ditch the rubber crank boots, which would contact the chainstays on the frame while pedalling. 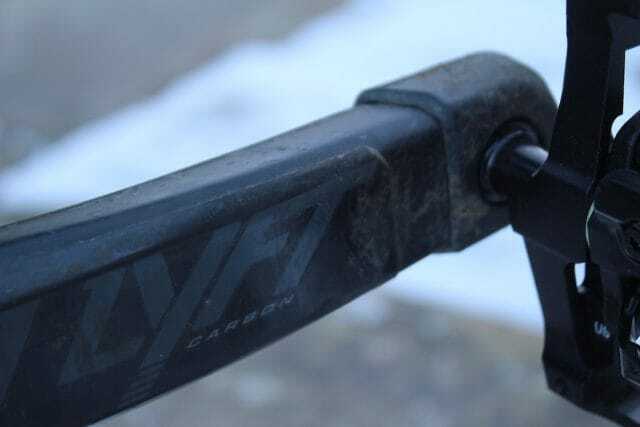 Clearance issues on the Whyte T-130. I spoke with Praxis about this clearance problem, and it’s apparently the first bike that Praxis has heard of with the issue. It may speak more as to the width of the chainstays on the T-130, but compared to the more slender arms used on comparable SRAM carbon cranks, the Lyft arms are noticeably chunkier. 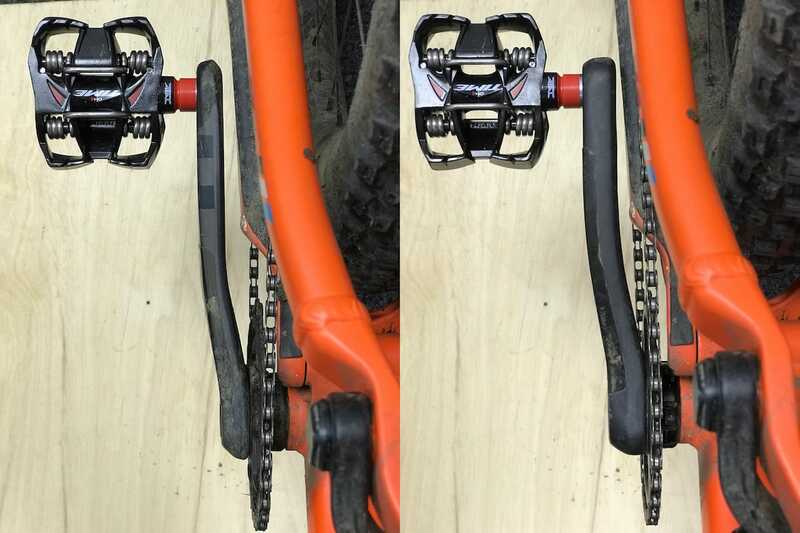 This is definitely something to consider if clearance is already at a premium with your current cranks. We’ve been running the Lyft cranks for the past five months, and they’ve spun freely and quietly from whoa-to-go. In that time they’ve been punished with a barrage of mud, plenty of Pennine grit, and more than their fair share of degreaser and bike cleaner. Despite the routine water submersions and general lack of care, the bottom bracket is still rolling smoothly and without notchiness. 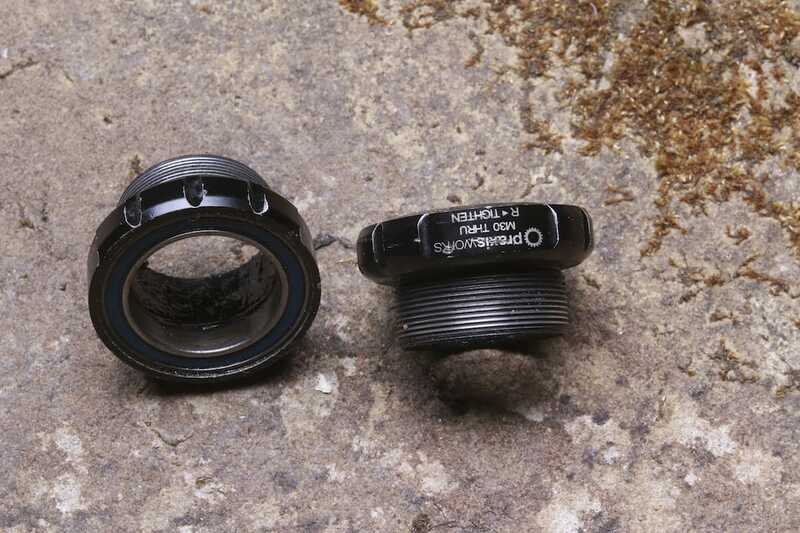 I was surprised by this, as the bottom bracket cups lack any internal plastic sleeve to seal the bearings from water that pools inside the bottom bracket shell. 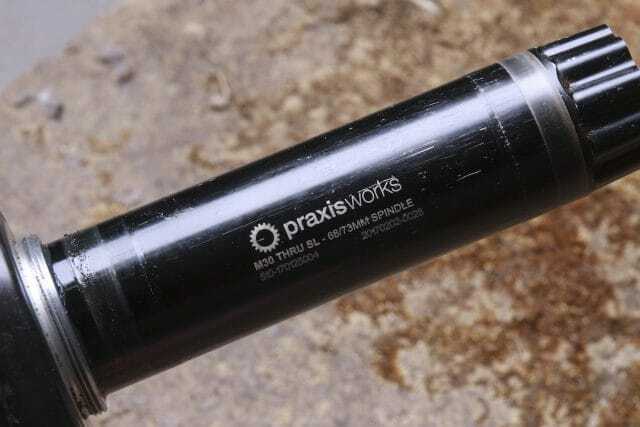 It probably goes to show the quality of bearings and seals that Praxis is using in the first place, but I can’t help but feel that one of those cheap plastic sleeves would be worth the added insurance. Those carbon cranks aren’t just hugely stiff, they’re also very good at absorbing trail vibrations. 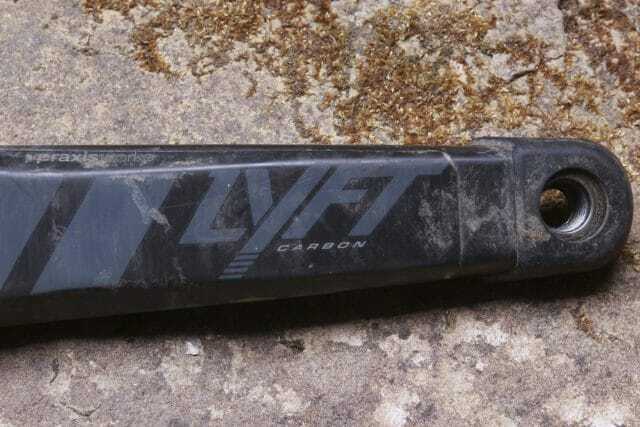 As for the Lyft’s ride quality, the carbon crank arms do provide a noticeable boost in stiffness compared to most alloy cranks. Leap out of the saddle and press the pedals in anger, and there’s less twisting and bending underneath your foot, with more of that power going straight into the drivetrain. For heavier riders and XC racers, this added stability and efficiency will be welcome. What’s most impressive with the Lyft cranks though, is that somehow they manage to achieve this added stiffness without feeling harsh. Granted, this is something you’ll notice more on a hardtail, but even on the big Stage 5, the Lyft cranks were effective at dissipating smaller vibrations over their alloy brethren. Is it night and day? No. And it’s unlikely you’d really notice it unless you were routinely swapping cranks around and back-to-back testing like we were. But there is a difference. No narrow-wide tooth profile here. 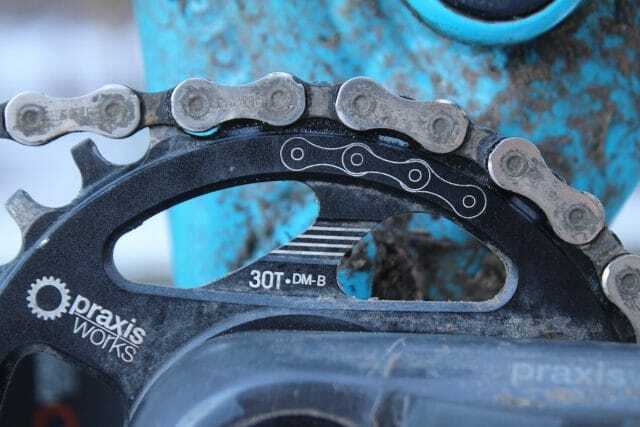 I chose a 30t Boost-offset chainring, though Praxis offers its direct mount chainring sizes from 28t up to 36t and in both Boost and non-Boost offsets. Replacement chainrings are £55, though because the chainring mounts by the same 3-bolt standard that SRAM cranks use, you’ve got a whole load of aftermarket options when it comes time to replacement. Given the number of different standards for bolting a chainring to a crankset, it’s nice that Praxis chose to use an existing one, rather than imagining another standard. Look closely at the chainring, and you’ll that it doesn’t use the regular narrow-wide tooth profile. 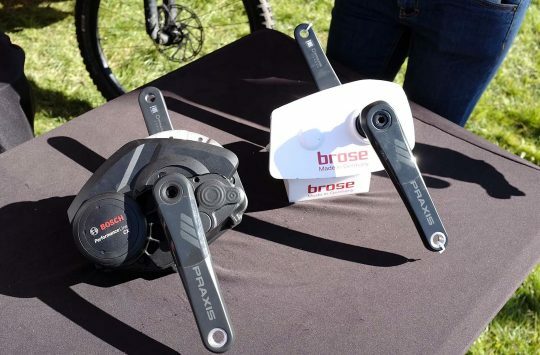 Instead, Praxis is licensing MRP’s Wave Tech design that bypasses SRAM’s patents by using alternating inboard/outboard teeth that sort of ‘wave’ from side to side as you spin the cranks. In theory, this design grips the chain in a similar fashion to a narrow wide chainring, and Praxis states that you can run the Lyft cranks without a chainguide for all but the bounciest of trails. To help get installation right, there’s a small graphic on the chainring that indicates the correct orientation for the chain. 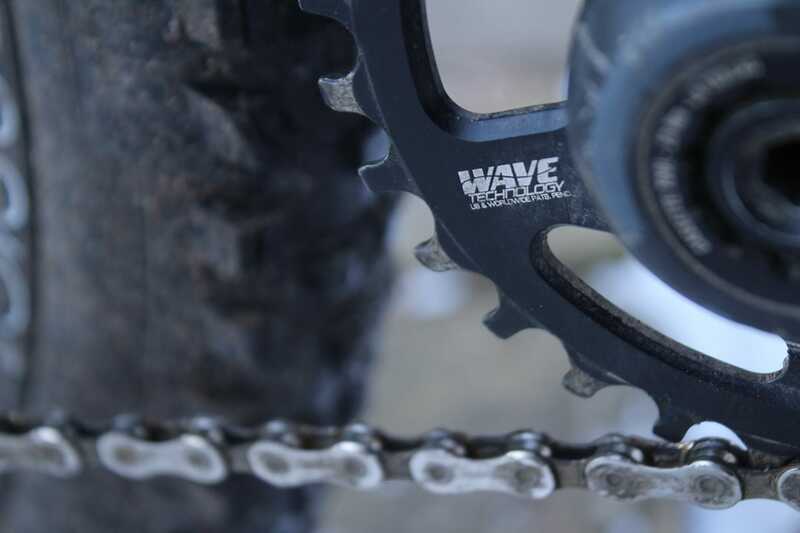 The Wave Tech ring includes a graphic to help with correct chain alignment. 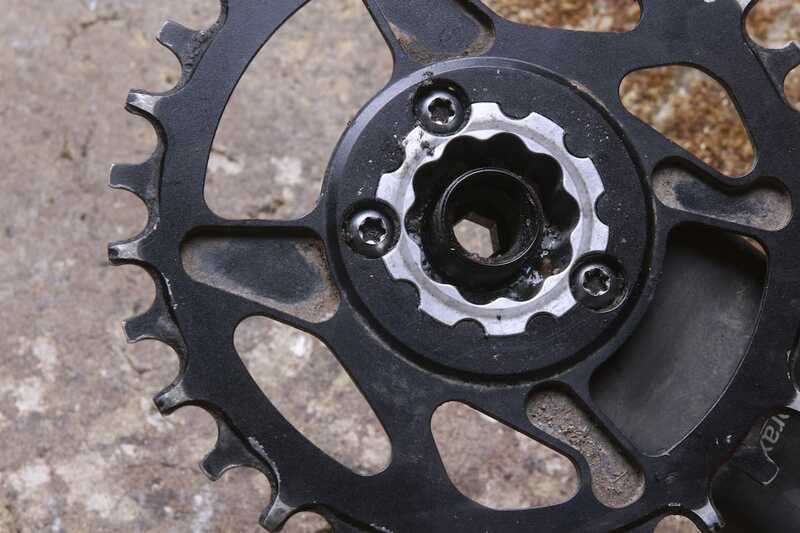 For the first 100km or so of riding, the Wave Tech chainring worked as advertised. It was smooth, quiet, and surprisingly good at shedding mud – something that most narrow-wide chainrings do struggle with. As the alloy teeth began to wear in though, I started having issues with chain retention, with the chain coming off the ring at least once every ride. Typically this was while riding high-speed chattery packhorse trails – the kind that leave your calves and shoulders numb from shuddery vibrations. But I also had the chain drop on much smoother trails too. It didn’t seem to be restricted to a particular chain type either, as I tested the Lyft cranks with SRAM and Shimano derailleurs, and with 11-speed and 12-speed chains. That said, I did get another tester to run the Lyft cranks for a week of rocky riding in the Pyrenees, and she had no issues with the chain coming off at all. 3-bolt chainring pattern is the same as SRAM. A lightweight upper guide would be an easy solution to provide some additional security, and to be fair, most competitive XC racers and enduro riders would use anyway. And in my experience, if you’re the sort of rider that keeps your tyres on the ground while riding smoother and less choppy trails, then chances are you won’t encounter the chain-drop issues I did. I must say that I have been rather spoiled SRAM’s latest X-Sync 2 chainrings featured on the Eagle 1×12 groupsets, which to this date I have never dropped a chain with. Personally, if I was going to be holding onto the Lyft cranks for longer, I’d look at fitting a SRAM X-Sync 2 chainring for the added security. These are very light and well-made cranks, but chain-drop issues marred our experience with them. For Praxis’ first carbon fibre crank, the Lyft is an exceptionally well-made piece of kit. As I’ve come to expect with other Praxis components, the Lyft span smoothly and quietly throughout testing, and its gorgeous carbon fibre construction means it is one of the lightest on the market. 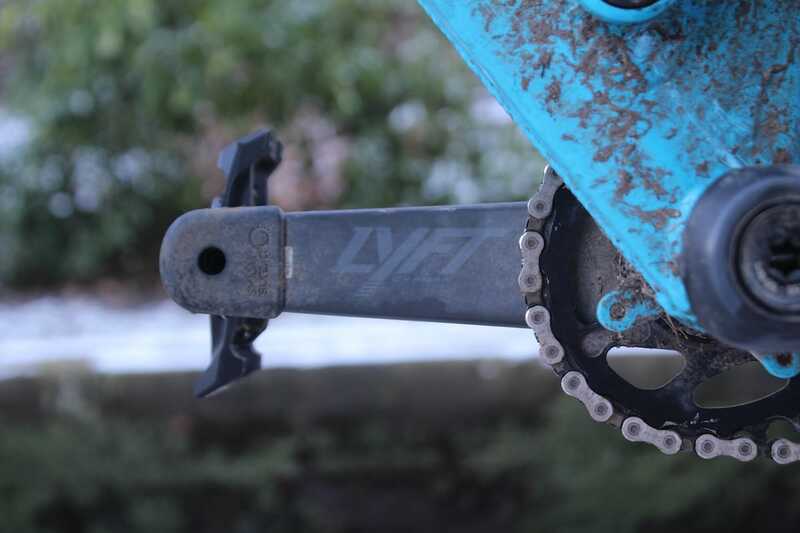 Although we have no reason to doubt the strength of the Lyft cranks, it’s worth noting that there is a heavy duty (HD) version that adds about 88 grams for the particularly louty riders out there. Unfortunately, our experience with the Lyft cranks was marred by regular chain-dropping issues, which ultimately let them down. Running 1x should be pretty foolproof these days, but in the case of the Lyft cranks you’ll want to consider adding an upper guide if chain security is a priority and you’re riding anything other than buff singletrack. Is This The Most Miserable Form Of Cycle Racing Ever? Enter Now! The thing is – unlike Race Face Next SLs these are still in one piece after 5 months of use… There are at least 20 failures that I know of of the Race Face cranks, and whilst they have always replaced them, that doesn’t help when they cause a DNF. That reliablity is worth a huge amount in my book. Surprised you had chain issues – none here at all despite being ragged round various European Marathons last season. @gee – I can confirm that the Lyft cranks are indeed still in one piece, despite being ridden well outside their intended usage. The Lyft HD cranks probably would have been a better choice for the riding we did with these. And we’ve been just as surprised regarding chain retention. I’ve had plenty of chain drop issues with decently-worn narrow wide chainrings, but not nearly as frequently as with the Wave Tech ring on the Lyft cranks. So here is one bike which is definitely not compatible with these cranks: Canyon Spectral EX 2017. Left crank strikes the chainstay right where the bottom main pivot is (there is like 2mm overlap there). This was an expensive experience for me.